Self-assessment Guide: Using COBIT ® 5 Personal Copy of: Mr. Rungga Reksya Sabilillah Self-assessment Guide: Using COBIT® 5 ISACA® With more than 100,000 constituents in 180 countries, ISACA (www.isaca.org) is a leading global provider of knowledge,... COBIT Self-Assessment Guide: Using COBIT 5 is also available as a complimentary download to both ISACA members and nonmembers. This 'stand-alone' publication can be used by organisations to perform a less rigorous assessment of the capability of their IT processes. 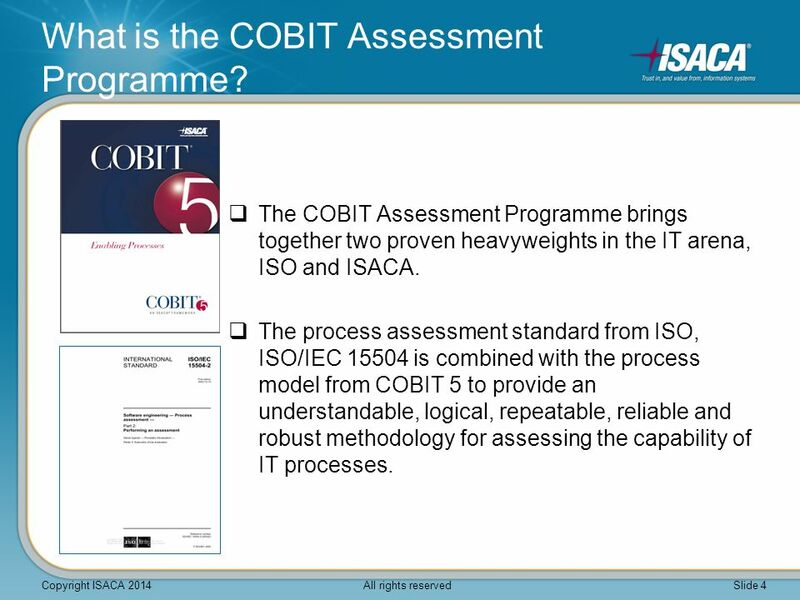 COBIT Self-Assessment Guide: Using COBIT 5 is a "stand-alone" publication, which can be used by organisations to perform a less rigorous assessment of the capability of their IT processes. “The Assessor Guide: Using COBIT 5” provides the main guidance on performing a process capability assessment, the roles, responsibilities and competences required and the key steps required, from assessment initiation to reporting of the assessment results. COBIT® Self-assessment Guide: Using COBIT 5 is an alternative assessment guide describing a less rigorous approach, as a simpler entry point to this type of assessment activity. 1.6 Comparison of the COBIT 4.1 PAM to the COBIT 5 PAM One of the primary differences between the COBIT 4.1 PAM and the COBIT 5 PAM concerns the distinction made between governance and management.